Throughout the Western Church, we are marking today in the Liturgical Calendar as Trinity Sunday. This is the festal day for Holy Trinity Church, Rathkeale, Co Limerick – which is one of the four churches in my group of parishes – and this morning I am in both Castletown Church, Pallaskenry, and Holy Trinity Church, Rathkeale, presiding at the Eucharist and preaching. As it was after the first great Pentecost that the doctrine of the Trinity was proclaimed to the world, it is appropriate that the feast of the Trinity follows that of Pentecost. 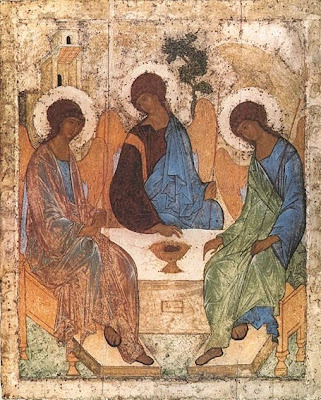 However, this tradition of observing the First Sunday after Pentecost as Trinity Sunday has unique roots in the Anglican tradition. Although this day is observed in all the Western liturgical traditions – Anglican, Roman Catholic, Lutheran and Methodist – it is not observed in the Eastern Orthodox or Eastern Catholic traditions, and is not found in the history of the Early Church. As I was preparing my sermons and selecting hymns for this morning [11 June 2017], I wondered how many parish churches in the Church of Ireland are respecting these liturgical provisions this morning? A quick glance at the Church Notices in The Irish Times online yesterday, or at the parish notices in many diocesan magazines this month makes one wonder. Although liturgically we are now in Ordinary Time, the liturgical colours change from green to white. The Book of Common Prayer (pp 771-773) places ‘The Creed (commonly called) of Saint Athanasius, also known as the Quicunque Vult,’ between the Catechism and the Preamble to the Constitution, but makes no provision for its use. However, some churches in the Church of Ireland and the Church of England, especially those with a High Church tradition, use this creed on Trinity Sunday. Pope Alexander II (1061-1073), refused a petition for a special feast on his day. Although he did not forbid the celebration where it already existed, he pointed out that such a feast was not customary in the Roman Church, and that the Church honoured the Holy Trinity every day with the use of the Gloria Patri. When Saint Thomas Becket (1118-1170) was consecrated Archbishop of Canterbury on the Sunday after Pentecost Day, his first act was to decree that the day of his consecration should be held as a new festival in honour of the Holy Trinity. This observance spread from Canterbury throughout the Western Church. In the following century, a new Office for the Holy Trinity was written by the Franciscan friar, John Peckham (died 1292), who was a Canon of Lyons and later became Archbishop of Canterbury. Pope John XXII (1316-1334) ordered the feast for the entire Church on the first Sunday after Pentecost, establishing Trinity Sunday as a Double of the Second Class. It was only raised to the dignity of a Double of the First Class by Pope Pius X on 24 July 1911. Surprisingly, this feastday never spread to the Orthodox Church. In the Eastern Orthodox and Eastern Catholic Churches, the Sunday of Pentecost itself is called Trinity Sunday, and instead the Sunday after Pentecost is celebrated as All Saints’ Sunday. The Monday after Pentecost is called the Monday of the Holy Spirit, and the next day is called the Third Day of the Trinity. Although liturgical colours are not as fixed in Eastern practice, where normally there are simply ‘festive’ colours and ‘sombre’ or Lenten colours, in some churches green is used for Pentecost and its Afterfeast. Some of this material was used in an earlier posting on Trinity Sunday in 2008. Thank you for aiding my understanding of Trinity Sunday. I attend Trinity Lutheran Church in Milwaukee, Wisconsin, USA, and in our congregation Trinity Sunday is a beloved festival. I appreciate the historical insights you provided. Blessings on your ministry on this Trinity Sunday!